Join us for this year’s symposium – three days of presentations and performances not to be missed! Studio Ju Ju will present on our work with Sub Ambient Sound Lab. New Adventures in Sound Art (NAISA), the Canadian Electroacoustic Community (CEC) and the Canadian Music Centre (CMC) are pleased to announce the 11th edition of the Toronto International Electroacoustic Symposium (TIES), and delighted to welcome Québec sound artist Chantal Dumas as Keynote Speaker for TIES 2017. Dumas is a highly respected sound artist who explores the medium of sound through the production of audio fiction and docufiction, sound installation, composition and sound design. The symposium will take place in Toronto from 9-12 August 2017 in Toronto’s Distillery District. TIES includes papers, lecture-recitals and several concert works curated by an international jury. It is an annual opportunity for exchange between diverse EA communities. Here are 10 suggestions for how to compile and share academic makerspace metrics. • Student engagement, classes and workshops in the space. • Ticketing systems that your institutions might already license. UVM uses Footprints and we started using it to track FabLab projects two years ago. • Checking photo ids and driver’s licenses and collecting information from them. • Break beam sensors and counters. Build your own! 3. Track who uses your space. Even if you want to keep it simple and just track student ids and course numbers, your registrar’s office or the like can run this information for you and provide demographics like gender and major. If you want to take more information you can identify academic department usage and your different audiences such as students, faculty, and visitors. 4. Don’t forget to track special events and tours. Keep track of special events and guests to your space. For example, prospective students, visiting educators, local businesses, local and state government, etc. For a prospective student tour, it might not be practical to get information about individuals, but you can track more broadly. For example, you can track how many prospective students and family members participated in an open house event that included a tour of your space. 5. Track how the space is being used. Based on usage what machines are getting the most use? This could inform future purchasing decisions. Also consider asking your users what tools they would like access to that you don’t currently have. Use this information to assess the future machine makeup of your space. 6. Identify how your makerspace plays a role in student recruitment and retention. Is your space a deciding factor when students enroll at your institution? How do tours of your space support student recruitment and how does access to your space support student retention? Survey your students to find out. 7. Compare how your makerspace is used in comparison to other facilities in your institution. Compare your numbers with those of other labs and facilities like the library, gym and other places that encourage learning outside the classroom. 8. Pay attention to your space’s demographics. Across the board makerspaces are used more frequently by white males than other groups. The Mechanical Engineering Department at the University of Delaware has noticed that through assigning individual projects (rather than group projects) more female students are engaging in the use hands-on tools and technologies. Does the diversity balance of your school match that of your space? By assessing this information you’ll be able to identify how welcoming your space is to different groups at your school. Remember to keep track of the events you hold in your academic makerspace. Let’s pay attention to the environmental impact of makerspaces, this is also a meaningful metric. The consumables we use at the UVM FabLab like pressed board and colored PLA and ABS plastics are very difficult to impossible to recycled locally and in some instances aren’t recycled anywhere. We have the potential to deepen the innovation potential of makerspaces if we can manage our plastic waste. If our bad print runs end up in the Great Pacific Garbage Patch that’s not innovation that’s just a sad everyday story. There are some interesting prospects out there for turning ABS and PLA printing waste into recycled filament, least of which is Filabot, a company founded in Vermont that sells grinders and spoolers. We’re looking into this and will follow up in a future post. Are students who use makerspaces during their education more employable when they graduate? If students are learning key skills like those identified in this Forbes article about what employers want in graduates, are educational makerspaces making our students more employable? From my experience in the UVM FabLab, I see the students practicing the following skill sets mentioned in Forbes every day. We’ll only know if we ask and track. If we can tell the educational makerspace story and back it up with solid metrics, we’ll improve the likelihood that our maker initiatives have staying power in the U.S. It’s also a way to start connecting the dots between makerspaces and flexible learning pathways (i.e. Vermont Act 77), active learning, hands-on learning and Project Based Learning. Special thanks to the Malcom Cooke of ThinkBox at Case Western, Jennifer Buckley from the University of Delaware and J. Linsey of Georgia Tech. They were the presenters in Session 14: Metrics, Data and Measuring Impact and inspired the following top ten list. The Spring 2017 issue of Summit magazine highlights prototyping and research in the UVM FabLab! Enjoy this photo essay that shows student and faculty projects coming through the lab. This summer the lab’s new bigger space is under renovation. We’ll be open for the fall 2017 semester. Hi Friends, Here is the poster and the press release for the Ideathon we hosted in February along with a link to an event at Stanford that influenced the event agenda. I’ll keep you posted as the winning project evolves. Stay tuned. UVM’s ideathon was inspired by the dismal voter turnout of the 2016 presidential election. Only 55 percent of voting age citizens cast ballots, the lowest rate in 10 years, according to CNN. The winning entry in the University of Vermont’s first “ideathon” is a pocket guide that will make it easier for UVM students to vote in national elections by providing them with state-by-state information on casting absentee and early mail-in ballots. Many students at the university are not from Vermont and are registered to vote in their home states. The guide was created and developed by Wyatt Chia, a Ph.D. candidate in the Cellular, Molecular, and Biomedical Science Program, with help from teammate Jenn Karson, a lecturer in the College of Engineering & Mathematical Sciences. Ideathons have become popular in recent years as a kind of non-technical version of a hackathon, whose end product is an idea rather than an app. Like hackathons, ideathons harness the power of the group to address a single challenge. UVM’s ideathon was inspired by the dismal voter turnout of the 2016 presidential election. Only 55 percent of voting age citizens cast ballots, the lowest rate in 10 years, according to CNN. The event’s theme was to create ideas that would encourage more voting. The event attracted about 30 students, faculty and staff to the Hills Building on February 24 to take on the challenge. Eugene Korsunskiy, senior coordinator of design initiatives at UVM, led the brainstorming session, which saw six teams alternate between white boards stationed around the room as ideas took form and were developed. At the end of the event, six strategies for increasing voter turnout had emerged. The event was sponsored by the Office of the Vice President for Research. Rather than judge ideas on the spot, Richard Galbraith, vice president for research, who attended the event, asked teams that were serious about implementing their ideas to flesh out their concept in a formal proposal. Galbraith deemed the event a success. “This was a pilot to see if the UVM community was interested in participating in an event like this and if we could pull it off successfully,” he said. “Given the large group we attracted and the good energy in the room, I’d say we succeeded.” Galbraith anticipates sponsoring more ideathons in the future. The voter handbook Chia developed will also contain contact information for key absentee and early voting staff in each state, deadlines for all steps, and sample forms to assist in filling in the necessary information. Wynn will receive $1,000 to research information for the guide, design it, and print multiple copies that will be distributed widely around campus. A PDF version will also be available for download. Great job everyone! To view final project highlights from this spring’s Interactive Design and Prototyping catch the slide presentation and videos at the following link. The slideshow is at the top of the page and videos appear when you scroll down. 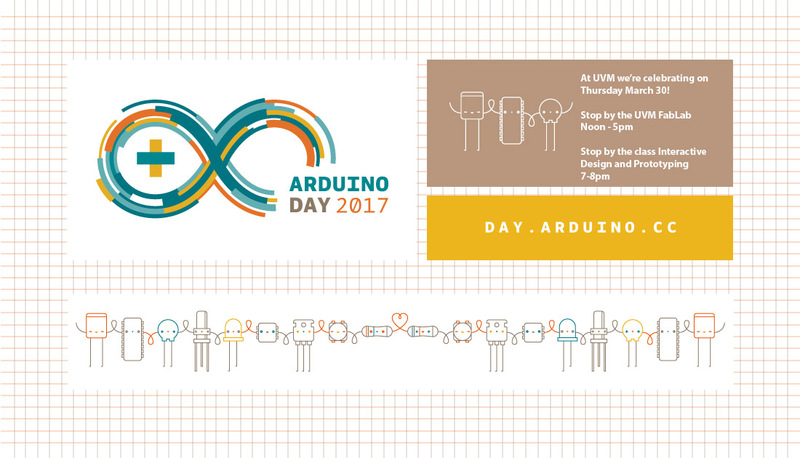 Thanks to all who joined us in the UVM FabLab for Arduino Day 2017! Great moments included meeting new students, faculty and “biofabbers” and visiting with UVM’s Office of Undergraduate Research. Here’s a nice option for art installations and sound projects that need to detect sound and/or measure sound amplitude. The SparkFun Sound Detector is a small and relatively easy to use audio sensing board with three different outputs. The Sound Detector not only provides an audio output, but also a binary indication of the presence of sound, and an analog representation of its amplitude. The 3 outputs are simultaneous and independent, so you can use as many or as few as you want at once. This first demo that includes and arduino and the sound detector board, starts with simple “claps” in order to demonstrate the binary indication of sound. Note that that the LED changes color and an indication light goes on and off on the sound detector board. The next demo uses a horn sound, the horn sound is more complex and an anolog representation of the sound is shown through the changing colors of the idea. As the amplitude of the sound changes so does the color. The third demo creates feedback using the sound detectors audio out and generating feedback with the use of the mini amp.